Everyone has a relative who's a bit eccentric. You might adore them. You might find them annoying. Regardless, kids love them because they give the loudest toys, display the weirdest talents, and tell the best stories. 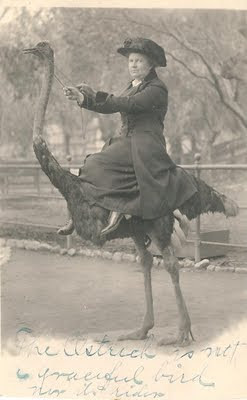 This picture of my ostrich-riding great grandmother Cora hints that she might have been that kind of woman. Then again, perhaps she and I are not so different. What oddball relative of your own comes to mind?